Disc brake conversion kit for 1964-73 Mustangs and other Fords utilizing the DRUM spindle. 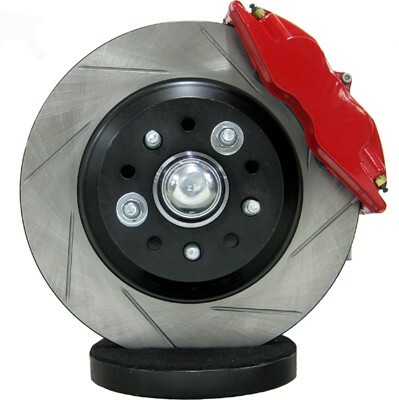 Features heavy duty directional vane 13 x 1.1" rotors, stress flow forged aluminum calipers with 4 stainless steel pistons that accept .800" thick pads in a variety of compounds. Our custom spindle bracket requires no modification to your DRUM spindles. Fits 65-73 Mustangs, Falcons and other Fords that used the same spindles. Direct bolt on to 65-73 Mustang V8 OE drum spindles (65-67 any spindle, 68-73 drum version only). Retains OE track width and enables use of some 16" and most 17" (or larger) wheels without spacers or modifications on wheels with enough pad height (spoke clearance to caliper). 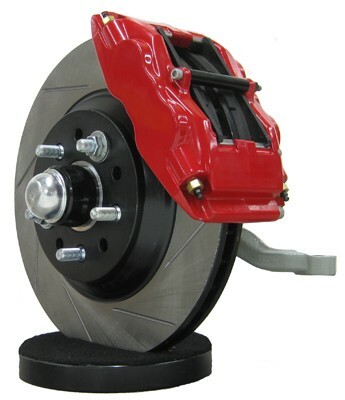 2 x Forged aluminum 4 piston calipers, powder coated bright red or gloss black. 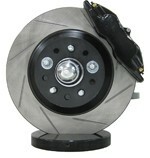 2 x 13" x 1.1" heavy duty rotors with directional cooling vanes. 2 x Hubs fitted with bearing races and standard length wheel studs (so you can use closed end lug nuts). 3" long ARP studs and open ended lug nuts also available. 2 x Hub centric adapter shims. 2 x Billet spindle/caliper mounting brackets. CAD designed and CNC machined. 2 x Timken inner bearings. 2 x Timken outer bearings. 2 x Timken inner dust seals. 2 x Stainless steel braided brake hoses complete with all adapters to connect to caliper and stock hard lines. Hoses meet DOT MVSS-106 requirements. 2 x Castle nuts (70-73 spindles use nut and castle style nut retainer). Grade 8 bolts and all the hardware to install the kit. Construction: Stress flow forged from premium grade aluminum alloy billets. This process re-aligns the metals internal grain structure to flow within the contour of the caliper body. This process eliminates the stresses and interruptions to the internal grain structure that occur when machining a straight block. This results in a stronger and stiffer caliper. 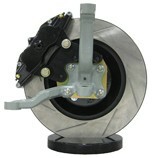 Pads: Continuing the performance trend of this system, this caliper uses a huge pad. Each pad is 0.800" thick, has an area of 8.2 square inches and a volume of 4.9 cubic inches. That is almost as thick as a stock Mustang rotor! Thick pads not only last a long time, they offer insulation from the heat of the rotor transmitting to the pistons and ultimately the fluid. Pad changes are super easy, simply remove the center bridge bolt and pull out the pads. Medium friction, smooth engagement, low abrasion. Flat torque curve. Maintains a coefficient of friction between .40 from cold peaking at .45 around 700F degrees. Beds quickly and provides fast response without excessive abrasion. High friction, smooth initial response, low wear rate. Medium to high friction with good cold response. Long wearing pad in the middle temperature ranges with only moderate wear in sustained high heat conditions. Peak coefficient of friction of .63 is reached at only 400F degrees and is almost flat all the way to 1300F degrees. Finish: Powder coated bright red or gloss black - other custom colors available. Notes: Each caliper is equipped with replaceable stainless steel bridge plates. 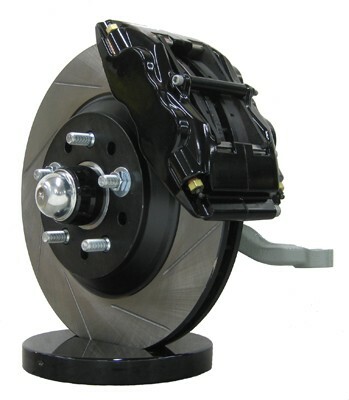 These plates eliminate the bridge wear caused by pad gouging and extend the service life of the caliper body. 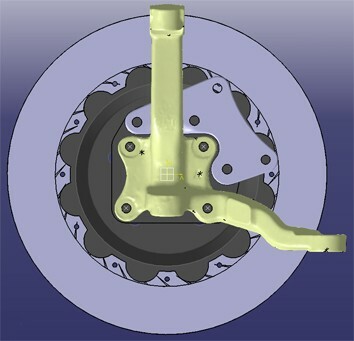 The spring-loading action of the plates also eliminates pad rattle and dampens the vibration harmonics that contribute to squeal under braking. Other standard features include high-temperature, square faced o-ring seals for positive sealing, controlled piston retraction, and long service life in high heat conditions. Stainless steel pistons are used to resist corrosion and retard heat transfer from the pads. Two-piece bleed screw assemblies provide long, reliable service life and are easily replaced if necessary. 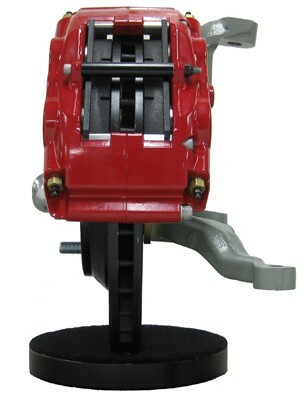 Caliper is mounted rearward of the spindle upright (trailing). This position makes routing brake duct hose in from the front of the car super easy. 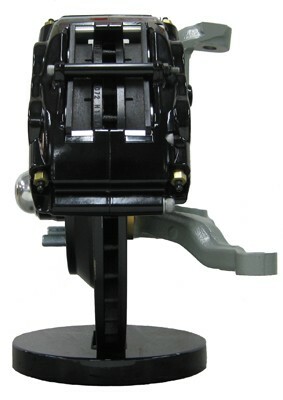 Use 1-1/8" bore master cylinder for perfect pedal height/pressure like #260-8556. Meticulous attention to detail and advanced computer modeling techniques ensure perfect fit. Our brackets are custom CAD designed, CNC machined, then plated for corrosion protection. Rear End Small Big w/2.5" offset Big w/2.36" offset Late (Torino) 8.8"
Axle Register 2.435" 2.80" 3.06"